Adebola Salako is the Founder and Programme Coordinator of Mantle of Mordecai Foundation. She was born as a third child on 13th May in the mid-eighties. Adebola had her primary education at Mary Magdalene Nursery & Primary school and University of Lagos Staff School. She subsequently attended Lagos State Civil Service Model College and Olabisi Onabanjo for her secondary and tertiary education respectively. She graduated with a first class degree in Biochemistry. Adebola’s commitment to ensuring that children succeed cannot be overemphasized. Her quest to ensure that every child has access to quality education regardless of the parental pedigree or source of livelihood; led to the conception of Mantle of Mordecai Foundation popularly known as MOM in August 2012 as an inspiration from God Almighty. Since then she has never looked back and has relentlessly ensured that she gets as many people involved in this calling as humanly possible. MOM (www.mantleofmordecai.org) is a registered non-profit organization in Nigeria and its primary aim is to seek funds to enable out- of -school children have access to quality education. MOM has children from different parts of Nigeria, but currently focuses on the children in Dustbin Estate, a slum in Lagos State Nigeria where families literally live on refuse dump. There are currently about thirty (30) children benefiting from MOM; twelve (12) beneficiaries enjoying full scholarship while others have periodic access to funds. Adebola is a deep lover of children and her country; her innermost desire is to ensure that the number of out-of-school children in Nigeria is reduced significantly. Adebola’s work is recognized both locally and internationally and she has been nominated for various awards. To mention a few; she received a New Leader for Tomorrow Diploma from the Crans Montana Forum, Monaco in Brussels June 2015. 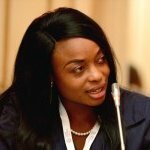 The Crans Montana Forum of New Leaders for Tomorrow is a unique Community of young leaders from Africa, the Arab World, Far Eastern Europe, Central Asia, South-America and Far East selected due to exceptional professional achievement and leadership experience in Businesses and Governments. These are young leaders visibly affecting their communities and helping to address the 21st Century major challenges. She also received an award from KPMG for contributing to her community in April 2015. Despite running MOM, Adebola is also a seasoned Risk Advisor who has worked with KPMG for over four years and is currently a Business Assurance Manager in Lagos, Nigeria. She is also a volunteer mentor for two prestigious foundations namely: The Cherie Blair Foundation for Women UK and The Tony Elumelu Entrepreneurship Programme (TEEP) Foundation where she mentors young women in their various business spheres. She believes life is too short and will be uneventful until every individual “pays forward” goodness in any way possible. Adebola lives her life daily by the astute words of Mohammed Gandhi and Nelson Mandela that says “if we are to teach real peace in this world, and if we are to carry on a real war against war, we shall have to begin with the children” and “there can be no keener revelation of a society’s soul than the way in which it treats its children” respectively.